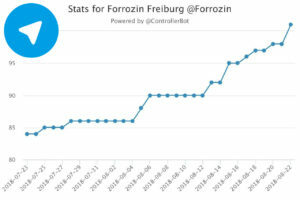 On the 22nd of December 2017 we created the Telegram channel“Forrozin” (https://t.me/Forrozin) where we publish information about Forró events in Freiburg. Alongside we have created a Telegram Chat for discussion about Forró as well as spontaneous dance-events. Today our channel has reached 100 Members! If you want to keep informed join the Channel now! If you do not have Telegram installed yet you can get it here. Other ways of contacting us are described here.